I feel that I should start this review by admitting that I’ve never read any of the Sherlock Holmes books. That being said, I love Sherlock Holmes – I love the BBC show (because Benedict) and the movies. I also own about five different copies and collections of Sherlock stories. I honestly don’t know why I haven’t read any of the originals yet. I picked this one up because it was Sherlock related, but also because I knew of Anthony Horowitz because of his Alex Rider series (I’ve never read them, but I loved the movie as a child.) This sat on my shelves for years after that and I probably never would have picked it up unless I’d seen the sequel, Moriarty, in the bookstore (it has a pretty cover.) This was also one of the books I picked out as part of my new Book Shame series. This took me a good two weeks to get through – not because it was boring or anything, but it is quite a slow book to start off with. I also didn’t have a lot of time to read this past week, especially as I was participating in RYBSAT. That being said, when I did actually pick this up I found myself completely sucked in by the story. It was like there was nothing else happening around me, my entire world just became Sherlock Holmes for that time. I think my favourite thing about Sherlock Holmes and the whole mystery genre is the fact that I can never really guess where the story is going. I know some people like to work out the mystery themselves, but I don’t think it’s nearly as fun that way. I definitely did not see this one coming, and I have to admit that there were parts that made me uncomfortable, I think that’s the best way to put it without spoiling the book. It was still really interesting to have all the dots joined together in the end. 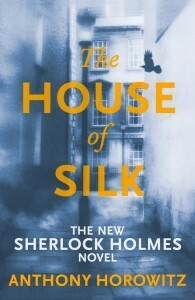 All in all, I would definitely recommend this for Sherlock lovers even if you haven’t dabbled in the books yet. And now, I’m going to go obsess over Benedict Cumberbatch…I mean *cough* rewatch Sherlock.